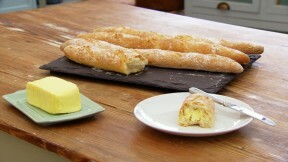 This baguette recipe by Paul Hollywood is the technical challenge recipe in the Bread episode of Season 3 of The Great British Baking Show. It is explained in further detail by Paul in Masterclass: Part 2. Put the flour, salt and yeast into the bowl of a freestanding mixer fitted with a dough hook (don’t put the salt directly on top of the yeast). Add three-quarters of the water and begin mixing on a slow speed. As the dough starts to come together, slowly add the remaining water, then continue to mix on a medium speed for 5-7 minutes, until you have a glossy, elastic dough. Tip the dough into the prepared tub. Cover and leave for 1 hour, or until at least doubled in size. Dredge a linen couche with flour and lightly dust the work surface with flour. Carefully tip the dough onto the work surface. Rather than knocking it back, handle it gently so you can keep as much air in the dough as possible. (This helps to create the irregular, airy texture of a really good baguette.) The dough will be wet to the touch but still lively. out by pressing heavily. Concentrate on the backwards and forwards movement and gently use the weight of your arms to roll out the dough to 30cm (12 in) long. Lay a baguette along the edge of the linen couche and pleat the couche up against the edge of the baguette. Place another baguette next to the pleat. Repeat the process until all 4 baguettes are lined up against each other with a pleat between each. Cover the baguettes with a clean tea towel and leave for 1 hour, or until the dough has at least doubled in size and springs back quickly if you prod it lightly with your finger. Preheat the oven to 464F and put a roasting tray in the bottom of the oven to heat up. When the baguettes are risen, remove them from the couche and dust lightly with flour. Slash each one 4 times along its length on the diagonal, using a razor blade or a very sharp knife. Transfer to a large baking tray. Fill the heated roasting tray with hot water, to create steam, and put the bread into the oven. Bake for 20-25 minutes, or until the baguettes are golden-brown and have a slight sheen. Cool on a wire rack. For this recipe you will need a freestanding mixer with a dough hook attachment, a 2¼ litre/4 pint square plastic container and a linen couche.